When individuals . . . feel weak, they cease to be interested socially but strive for [personal] superiority. They want to solve the problems of life in such a way as to obtain personal superiority without any admixture of social interest (p. 260). The idea of living on a vertical plane is . . . perhaps the most neuroticizing element of all [in a child's development]. Yet so much of the training of children is based on it: Hitch your wagon to the stars! The sky is the limit! Don't let anyone keep you down! You have to be better, more, than the next [person] (Sicher, 1955, p. 100). [In horizontal movement] the desire to be useful can never be frustrated. . . . Self-fulfillment no longer depends on what others think or do, but on what one can contribute. Concern with status is unnecessary, since one can be sure of one’s place in the group as an equal (Dreikurs, 1973, p. 41). 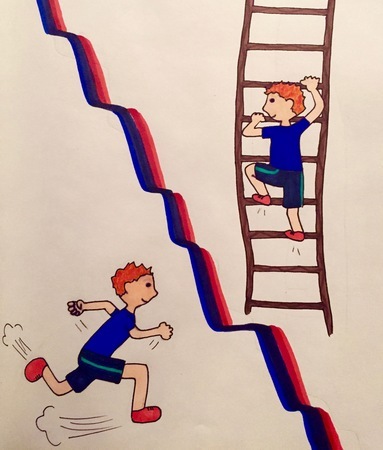 The vertical movement of self-elevation, regardless of the height it leads to, both in status and accomplishments, can never bring lasting satisfaction and inner peace. There is a constant danger of falling and failing; the gnawing feeling of real or possible inferiority is never eradicated, regardless of success (Dreikurs, 1973, p. 41). In view of these obvious consequences of a mistake-centered orientation, why is it then maintained? Two possible reasons seem evident. One is a vestige from an outgrown autocratic society. In such a society, doing wrong means not doing what one is supposed to do, and this is intolerable, as a defiance of authority. . . . [A second cause] . . . lies in the competitive strife on the vertical plane. Making a mistake . . . lowers one’s social status, as being right increases it. . . . Once we free ourselves from our fear of being INFERIOR and recognize our worth and dignity, we no longer fear making mistakes — and therefore make fewer. This is learned in psychotherapy. Our educational institutions are not yet prepared to teach this new social value of the courage to be imperfect (Dreikurs, 1973, p. 43). © Griffith, J., & Powers, R. L. (2007). The Lexicon of Adlerian Psychology: 106 terms Associated with the Individual Psychology of Alfred Adler (2nd ed.). Port Townsend, WA: Adlerian Psychology Associates (p. 56). During this consultation hour Dr. Colker discusses with students how to apply Adlerian concepts to aspects of organizations and social structures. Power, privilege, and social equality are discussed. The application of Adlerian principles to responding to police accountability is explored in depth. This co-led, in depth forum on Leadership and Organizational Development focused on bringing concepts of Adlerian Psychology into organizational work. Time- 1:15:42. This co-led, in depth forum on Leadership and Organizational Development focused on bringing concepts of Adlerian Psychology into organizational work. Drs. Jay Colker and Paul Fitzgerald brought years of organizational consulting experience and Adlerian based training to the forum which provided real world illustrations into the discussion. Adlerian concepts of belonging, horizontal movement, useful behavior, and more are brought up in regard to this topic. The second part of a co-led, in depth forum on Leadership and Organizational Development focused on bringing concepts of Adlerian Psychology into organizational work. Time- 1:19:44. This co-led, in depth forum on Leadership and Organizational Development focused on bringing concepts of Adlerian Psychology into organizational work. Drs. Jay Colker and Paul Fitzgerald brought years of organizational consulting experience and Adlerian based training to the forum which provided real world illustrations into the discussion. Adlerian concepts of belonging, horizontal movement, useful behavior, and more are brought up in regard to this topic. Colker and Fitzgerald use open-forum counseling to help resolve a real organizational problem in this second half of the forum.